Empetrum atropurpureum Fern. & Wieg. This low-growing, evergreen shrub typically inhabits the rocky shores and dunes along the eastern coast of Canada, but it also occurs inland along the margins of a few major lakes (Soper and Voss 1964). In Minnesota, Empetrum atropurpureum was first discovered by Rydberg and Rosendahl in 1929 on an Island in Lake Superior in Cook County, who described the habitat as "... moist place, base of rock ledge...infrequent" (Butters and Abbe 1953). That population was relocated in 1948. Three more populations of E. atropurpureum were documented in the 1930s and 1940s, each from a different island but in the same vicinity as the first. In 1980 a fifth location was found, but some of the previously discovered populations appeared to have declined. Empetrum atropurpureum was listed as an endangered species in Minnesota in 1984. Empetrum atropurpureum is a low, creeping, evergreen shrub with inconspicuous flowers and a berrylike fruit (drupe). There are 2 species of Empetrum in Minnesota that are closely related and difficult to distinguish. In E. atropurpureum, the branchlets and margins of expanding leaves are white and tomentose (with dense, woolly hairs) but not glandular. The leaves spread outward from the stem at right angles or they are directed forward; rarely are they bent backwards. Also, the fruit is purple. In the other species, E. nigrum (black crowberry), the branchlets and margins of young leaves are not tomentose but are minutely glandular, the leaves soon become reflexed, and the fruit is black (Love 1960). All of the Minnesota E. atropurpureum records are from a small group of islands in Lake Superior. Plants occur in crevices on barren shore rocks and on cliff ledges, in settings where they are not subject to constant or intense wave action, or severe ice-scouring. In some cases, plants are near the forest margin and may be partially shaded. The forests on the islands are dominated by Picea spp. (spruce) and Abies spp. (fir) trees. Similar rocky habitat exists on the shore of the mainland less than 1 km (0.6 mi.) away, but E. atropurpureum appears to be restricted to the islands. Characteristics of E. atropurpureum are like E. nigrum. It is a small, low-growing, woody plant that forms a mat. Stems are prostrate and repeatedly branched. The mat may be compact (especially if growing in a narrow crevice), or it may sprawl across the rocky surface with the younger branchlets creeping outward from the main mat. 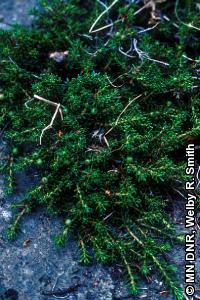 The branches and branchlets are quite uniformly and densely covered with small, evergreen leaves. Leaves are only 4-8 mm (0.2-0.3 in.) long and the margins roll inward toward the underside of the leaf. Details of its life history in Minnesota are not known. Voss (1985) emphasizes that specialists have difficulty placing the members of Empetrum into well-defined species or subspecies, and that one approach is to consider E. nigrum as a single, highly variable species. That interpretation would combine E. atropurpureum with Minnesota's other rare Empetrum, E. nigrum, even though E. atropurpureum appears distinct in Minnesota. Because this species is evergreen, E. atropurpureum can be seen and identified anytime of the year that it isn't covered by snow. Empetrum atropurpureum is at risk because it faces the same general problem as other rare, subarctic plants in the Lake Superior region: suitable habitat is extremely limited and it is vulnerable to a variety of threats, including global climate change. People are drawn to rocky areas, especially shoreline areas, for their beauty and for recreation. Fortunately, the places where this plant occurs are remote and inaccessible enough to minimize threats from human activities. Several, if not all, of the sites where E. atropurpureum has been found face a greater threat from nesting gulls that utilize the same rocky coast. Ring-billed gull (Larus delawarensis) populations in particular have increased dramatically in the Lake Superior basin in the past 20 or so years. Significant disturbance of shore edge vegetation by gull activity has been well documented (Bernard et al. 1971; Cuthbert and McKearnan 1998). The Minnesota Biological Survey for rare plants has been nearly completed in northeastern Minnesota, although some promising habitat for E. atropurpureum still remains to be searched. And yet, botanists agree that significant new populations are unlikely to be found. Thus, land managers now have a sound basis for implementing protection strategies. Bernard, J. M., D. W. Davidson, and R. G. Koch. 1971. Ecology and floristics of Knife Island, a gull rookery on Lake Superior. Journal of the Minnesota Academy of Sciences 37:101-103. Cuthbert, F. J., and J. McKearnan. 1999. U.S. Great Lakes gull survey: 1998 Progress Report. Report submitted to the U.S. Fish and Wildlife Service, Fort Snelling, Minnesota. Love, D. 1960. The red-fruited crowberries in North America. Rhodora 62:265-292. Shugart, G. W. 1976. Effects of Ring-billed Gull nesting on vegetation. The Jack-Pine Warbler 54(2):50-53. Sobey, D. G. and J. B. Kenworthy. 1979. The relationship between Herring Gulls and the vegetation of their breeding colonies. Journal of Ecology 67 (2):469-496. Soper, J. H. and E. G. Voss. 1964. Black Crowberry in the Lake Superior region. The Michigan Botanist 3:35-39. Southern, W. E., W. L. Jarvis, and L. Brewick. 1976. Food habits and foraging ecology of Great Lakes region Ring-billed Gulls. Pages 100-144 in Proceedings of the fish-eating birds of the Great Lakes and environmental contaminants symposium. Canadian Wildlife Service, Hull, Quebec, Canada.